It’s a Sunday which means I’m in my second home; church. The place I get nourished and prepare for heaven because “what does it profit a woman to gain the world and lose her soul?” The monthly afternoon service is a big deal probably because of the human need to have for validation, restored hope and assurance. This was a most special service because God would speak directly through his prophet or directly speak to me: A day I would be called to the podium and declared relevant by the deity. This Sunday literally marked two days to the 2013 general elections and the church leader was adorned in a red flowing sparkly dress, red lipstick and on her head, an equally red fascinator. She was a charismatic powerful woman with an aura of mysterious wonder. Politicians sought her out due to her influence among Christians across the country. The 2013 elections were very significant because both the Presidential candidate and his deputy were facing charges at the International Criminal Court on Crimes against humanity for the post-election violence of 2007-2008. About 1,000 lives were lost. People were locked up in a church and burnt to death! Those that tried to escape bear deep scars. Children witnessed their parent’s bodies being cut to pieces. Women and girls were raped and men were maimed. More than 600,000 people were displaced and a nation moved on like this was all a fictional episode. Those who survived these atrocities were left deep in trauma and unimaginable loss. Diana who is one of the survivors was present at this service. She noted how quickly the tone of the service changed from justice, judgment and finally to mercy. The Nation was expected to be on its way to healing because the two rival communities were now united. How can the people responsible for the massacre of her entire family be the ones anointed to lead the nation? No one was talking about actual justice or reparations. Diana was expected to move on. Silence was the price she had to pay for peace. Justice to her meant that everyone responsible was going to be put behind bars and that she would be compensated for everything she lost. She was told that vengeance was the Lord’s and she was told to forget it all because behold, God was doing a new thing. One of the things I find unforgivable about religion is its ability to suspend you in time by forcing you to forget your past yet at the same time convincing you how the present does not matter. There is zero intention of fighting to end oppressive systems that cause harm to the worshippers. Only focus is heaven. The church’s glorification of suffering is probably the reason we are dangerously passive in the face of oppression and poor governance as a country. The more we are oppressed, the harder we pray just like in the case of post-election violence where prayer was assumed able to cleanse injustice. The service should have been dedicated to the survivors of the post-election violence. We must all commit to holding space for each other to grieve without the need to hurry, silence or numb each other’s pain and grieving process. The service moved on to an altar call for sick people in need of a miracle and financial breakthrough. People made their way to the front. Those who could not make it to the front stood on aisles yet the problems that continuously drove us to the altar were not spiritual. country where everything is regulated and controlled by the government, it goes without saying that the quality of our individual lives begins and ends with the quality of leadership at the government level. It is a combination of personal responsibility and leadership. Nothing works without the other. A majority of young people dancing on stage were jobless, struggling to pay school fees, some had dropped out of school and life was a jungle. What if these young people embraced the table turning, foolishness whipping spirit of Jesus to fight for better services from public institutions? Would that not be a true revival? Instead, we pray for leaders and remain silent on their role in the dysfunction. When Jesus talked about being anointed to preach the good news to the poor and setting the captives free his mission was to comfort the oppressed and make the oppressors uncomfortable, but the oppressors got so uncomfortable that they crucified him. If your sermons don’t make you crucifiable, who are you really comforting? African liberation, the realization of African nationalists’ dreams seem farfetched. Africa has never been the continent that Kwame Nkrumah, Nelson Mandela, Mwalimu Julius Nyerere, Frantz Fanon wished it to be. It has turned to be a continent of regrets. A region that its population does not produce or manufacture to the level that it should, and those that do not trust its products. A continent that is at war with its citizens. In a nutshell, the motive behind the intermittent and protracted war against the colonial regime remains unfulfilled. Instead, more dawning revelations continue to diminish our efforts to make Africa great. Africa has never been a continent of its means. It’s a continent of dependence. It is where all the states are orphans and their only remaining godfathers are the European nations who dictate to us what is valid and invalid. Fifty years after independence, we have never learnt to appreciate to use our vast available resources. A continent that through the politics of incapability and inadequate capital, they have failed to not only develop industries but also even sustain the local industries that were left behind by the colonial powers. Africa has become a continent which has adopted the structures of democracy simply for political mileage. The continent has adopted democratic structures that do not seem to work. The tenents of democracy, a western based ideology, are theoretically contained in African constitutions. Elections for example though regular, rarely meet the democratic tests for credible, free, fair, accountable and transparent elections. The election outcomes have rarely represented the majority interests. Rigging, violence, assassinations, threats and intimidation have marred and characterized African elections. Unfortunately, the independent entities such as the judiciary due to threats and corrupt deals have given a clean bill of health to democratic processes that have been globally condemned. Instead of acting as a watchdog to the state, non state actors and state actors have continued to serve as puppets of existing régimes. African countries systems actually seem to malfunction. Mandela’s dream of having an Africa which is at peace with itself has never been realized. Hiding under the prism of national interests, African countries have engaged in intermittent interstate warfare and protracted domestic conflicts. African nations have never thought to use litigation or out of court settlement of dispute to end their woes. The opposition parties for example have led citizens to demonstrations that have culminated into destruction of political order and loss of lives instead of petitioning their cases before courts. Interestingly, states do not have confidence in their own courts such as the African Courts of Justice. They have disregarded their own courts and have preferred the International Criminal Court (ICC). Instead of changing the constitution to meet the peoples’ needs, politicians have drafted constitutions that actually suit their own narrow self-interests with majority of African leaders arm twisting the constitutions to make them life time leaders. Our continental leaders do not actually seem to care. They have justified their illegitimate regimes through force and intimidation. It is a continent of many odds. African electorates are to be blamed: We have opted for underperformers at the expense of performers. Our level of being inquisitive and holding leaders accountable is indeed wanting. We actually need to keep the spirit of our liberators burning. Their desire for an all-inclusive continent characterized by all the fruits and gifts of the Holy Spirit should indeed be put in practice. Kaudo Philip Misori is a student of political science, a writer to several platforms on political issues and a political commentator currently for Equator FM. Four months since Railways bus terminus became my drop off here in the CBD. One noticeable aspect was the dents on public transport vehicles at the stage, which can only be associated to either inadequate transport policy or failure in the implementation. Almost 85% of the public vehicles using the stage have dents and it’s a miracle that they are able to move. Most of the vehicles are in deplorable condition. Over time, on my daily commute, I have observed the presence of at least two police officers at the stage, including Sundays, but this does not change the chaos unfolding in front of your eyes, obstruction and competition to leave the stage has allowed me to understand the dents that appear on these vehicles. And every day the policemen stand there, they are to maintain the law but one wonders whether for them maintaining law and order is not part of their job description. Compounding the problem further was an incident where a driver just knocked the other in front of a police officer and nothing happened. Neither the drivers of the two vehicles nor the police talked about it as the police officer walked away smiling. From the look on his face, it was a normal thing. As the vehicles leave the station while approaching the roundabout just before they join Haile Selassie Avenue, a person normally boards, and in many instances as the vehicle moves, they’re given money and immediately alight before the vehicle moves too far. It concerned me who the person could have been and why the conductors gave money without any difficulty hence the reason I had to inquire. I would ask the driver every time I got the opportunity to seat next to the drivers who the people were. Their response were too proverbial as they were either called the agents of city owners or the stage owners. Finally, through persistence with the drivers, I came to understand that they were agents of either the city council or the police for protection. One of the drivers added that there was no way a vehicle could operate without being loyal to the agents but refused to indulge more on the same. Another peculiar norm at the stage is the removable side-mirrors. If you are keen, one will notice that some of the vehicles would remove their mirrors in the struggle to leave the stage and return them when it is clear. Additionally, hiking of bus fare at will is often evident. There is a culture of people asking how much they would be charged which for me was strange until I had to learn the hard way. In three occasions, I had to pay up to Ksh 100 for Kibra that is normally Ksh 50 during peak hours. Boarding the moving vehicles is the art at the stage, it is learned, and an accepted offence that police are never bothered about. The public are forced to board the vehicles while they are moving without consideration of the risks involved. What if one misses the step and falls? What about people living with disabilities? Thus my reflection on several attempts by the county government to bring order in the city. For instance, the recent order by the county to block public vehicles from accessing the CBD. What was the basis and were the stakeholders involved in coming up with the decision as provided for in the constitution? Seeming to be a welcomed problem but how could the county administrators correct a major problem like traffic with agents collecting money from the same matatu for protection while the same police own matatus as was recently alluded to by President Uhuru Kenyatta? And from nowhere, a new rule of car free days starting February 1st 2019 was announced with majority of stakeholders asking how they came about the decision and still there was no consultation or if there was then it was selective public consultation. Siasa Place conducted a twitter poll just a day after the announcement, asking if people in Nairobi would support the decision and 66% said no. The decision may succeed if the county takes note of what they had ignored in the past or the decision may as well form part of a statistic of failed decisions. The county requires good will in their approach of public engagement where the public are truly involved. They further have to invest in working with experts in the sector otherwise they will make the same mistake repeatedly, with no result for any of the decisions they proposed. With the promulgation of the Constitution of Kenya 2010, Kenyans foresaw a new nation. We did hope that it was just a matter of time for Kenya to progress from a developing to a developed nation. A new Kenya was indeed dawning. Assumingly, the constitution seemed comprehensive and one that would solve the pertinent problems that Kenya has faced since independence; injustices and impunity. As optimistic Kenyans did put it, “we have adopted an American constitution; soon we will be like the Americans”. Devolution became one of the principal motivators for the majority vote for the constitution. It would promote local participation, empowerment of the locals, improve transparency and accountability, promote equitable development through resource allocation and bring services closer to the people. Seven and so years after and this has prompted the political class that did fight tirelessly for the New Constitution to opt for another referendum factually to again find an avenue to satisfy their self, endless and broad interests. The new Constitution has debatably brought more bad than good to Kenyans. Is it because the political class lack the personality to drive the development agenda as contained in the comprehensive constitution? Or is it that the constitution was theoretically rigid and practically hollow? Why then does corruption still thrive, ethnicism commonplace, tribalism is still our culture and generally impunity and injustice are still part and parcel of the people of Kenya? Despite the constitution stipulating the need for a devolved system, the satisfaction of the people’s right to development still remains questionable. In the words of Amatyr Sen, “development is multidimensional and concerns human progress that is improved education, protection of people’s right, security, health amongst others.” The Pumwani hospital saga, the frequent medical strikes and other industrial actions are just but a few of the justifications of the malfunctionality of the health sector which legally became a devolved unit. Health sectors continue to remain understaffed, medical equipment remains insufficient and poor service delivery the trend. Honestly, the issue needs to be revisited but how? The legal framework that guides the medical sector remains inefficient as evidenced in the frequent medical saga as noted in the auditor general’s report 2017/2018 financial year that did expose massive corruption within the ministry. In deed our bureaucrats do not care to care. The constitution did create more political positions. This has hampered national development. With just a population of 50M, the Kenyan elective or political employees constitute around a fourth of the national population. Ironically, India which boasts of a population of over 1.3 billion just like Kenya constitutes a bicameral legislature. On a comparative basis, the rajha Sabha and the lok sabha constitute 245 and 545 members respectively. This translates to a ratio of 1 politician to over 50 million Indians. A similar trend is equally exhibited in USA.In Kenya, on the contrary, one politician represent tens of thousands. Real development does not actually come through over representation. Development comes through the existence of few, accountable, like minded individuals who have subordinated their self-interests for public gain. The existence of the many political seats has caused overlapping of functions and a debt burden with the nation indebted by over half of our national budget. This is actually an existential threat to our economy. The devolved system did devolve corruption. “This is the time for us to eat and that’s the reason for devolution, if you don’t grab now, then when?” These are some of the silent sentiments the political class do say. Actually, since the implementation of the new constitution corruption has intensified and the war against it has been that of a toothless dog. The auditor general reports on several counties and state departments amongst them Homabay, Kisumu, Nakuru, Machakos, Nairobi have been able to expose the diversion of public resources for self-satisfaction. Evidently, as a result of corrupt deals, they drive posh cars, live in palaces, and eat in expensive hotels as their electorate continue to languish in abject poverty. As a solution, Kenya has to rethink its constitution. Despite the argument of over representation the nation’s greatest threat to national development remains failure of institutions to fully implement the doctrines of chapter six, Leadership and Integrity. The chapter clearly stipulates the expected code of conduct of each state officer, restrictions on activities of state officers amongst other tenets. The executive has on several occasions acted in full contravention to this pivotal tenet. At times, the bureaucrats has appointed and nominated individuals who do not satisfy the constitution to hold public offices. Ironically, the legislature has approved these individuals. This has perpetrated corruption and abuse of office. Appointments based on political patronage, nepotism and tribalism should be made a thing of the past. Honestly even if the women representatives position is scrapped off, the counties reduced and the ward representatives equally reduced as many opine while corruption still persists, our country will continue to remain in the same state of nature it is in now. The debts we owe to developed worlds and financial institutions are not significantly caused by the wage bill but rather corrupt deals by our elected leaders. Offices countering corruption should be strengthened. This should encompass increased financial assistance to enhance their investigative capacity. As contained in the Chinese constitution, the anti-corruption legal provisions should be amended to make them more strict including but not limited to even death sentence. Electorates should reject in totality leaders who instead of pursuing common interests pursue self-interests. A good politician is one that respects the will of the people and considers the interests of his people paramount and others secondary. Politicians exist to facilitate the smooth distribution of the limited resources. Even though Kenya needs a constitutional review, Kenyans have to be very careful with its provision otherwise we may be again deceived by a half-baked constitution. First and foremost, Kenyans must be inquisitive to find out whose interest is in the constitution. Is it for the people of Kenya or again for the political class? Is there need to create the post of prime minister and his deputies as well yet the constitution focuses on reducing the wage bill. The fact that a parliamentary system works smoothly in Britain does not necessarily mean that it shall be a success in Kenya owing to the differences in the ecological environment. Devolution for example is a success in USA and totally a failure in Kenya. Kenya needs a constitution that reflects the needs of her population and not a copy and paste strategy from developed nations. We have to get concerned about why we have been fed up with the constitution just less than 10 years after its implementation and why the same drafters and politicians who convinced Kenyans on how the constitution was best are now oppossers of their own ideas. What seemed to have changed? The writer, KAUDO PHILIP, is a former student of Miyuga, Lifeshine Sondu and Oriwo Boys High School and currently a fourth year at Maseno University Pursuing Political science. There was a time in 2016 I was volunteering for an Organisation that was training young children in primary schools on the ways to be a social entrepreneurs and why it was important for them to be social entrepreneurs. At that time I was so disappointed by the manner in which the government was running the affairs of this country and I thought social entrepreneurship was the way to go and that it would fill the void left by the government’s inadequacy. I was so sold out to this cause that I even did a video and in that video I stated how my dream was to see an Africa where politicians were so irrelevant and redundant that citizens were running their own affairs. I was onboard with the social entrepreneurship wagon and I was not going to falloff. When I lookback at this thinking, I don’t know whether to hug my younger self or give her a book. I will probably do both. It then goes without saying that when we fail to be engaged in political conversations as women and as young people, the decisions about our resources will be made in our absence, without our consent, without our knowledge. Whenever we pay our taxes either in form of V.A.T or Pay As You Earn, it’s not just the money we give to the government, it’s our time, our energy, our emotions, our blood, sweat. If you pay a tax rate of 16 % that is 16% of your life and you have every reason to be involved in what the government does with that fraction of your life. If you will not be involved for anything else, be involved because the government has made it mandatory to invest a fraction of your life into it. If there is anything we have learnt especially through this election cycle beginning 2017, is that all the aspects of our lives are determined by the type of politics. Everything from the price of fuel, to the availability of the said fuel, the quality, price and availability of sugar, the form one selection, KCSE and KCPE results, price and availability of charcoal the list is endless. The point here is when you look around your home, office, classroom, road everything around you is literally affected by the political environment including yourself! If you doubt whether your existence is controlled by political forces, ask families who had to bury their loved ones simply because their community was considered a political liability. Go ahead and ask the Somalis who were rounded up at Kasarani because they were “terrorists” ask the Luo community how many bodies were thrown into Lake Victoria because they were “idle rioters” ask the families of young Kikuyu men from Nyeri and Muranga who were killed because they were part of “Mungiki” ask the survivors of the 2007/2008 post-election violence. Voting is just one step, a civic duty but that is just the beginning, it is not where we end. The political environment is kept healthy through our continuous active participation as citizens. I encourage everyone to be active politically. Be a pain, a stubborn head ache, an annoying pimple on their forehead, a difficult to ignore itch on their skin until the next election. After you vote, repeat the cycle. So how do you do this? I am glad you asked. The easiest representatives to get a hold of are the members of the County Assembly. They have an ability to be canny and slippery but they are reachable. Find out where their offices are and the days they meet with the people. For most wards it is usually on a Monday, but find out. Join youth groups within your area and organize to meet your area MCA because checking authority is not a one person job, and it is not an activists job.. it is our concern and right. Ask what has been the progress, point out the promises made during the election period, point out the persistent problems you have had to survive and ask them to explain what has not been done and why. Please don’t accept empty answers. And take part in public participation forums in your area, what are in the budget plans for your area? Find out! Democratic Leadership is a collaborative process; it is not leadership if it doesn’t work for and with the people. Many simply refer to corruption as indubitably the biggest impediment to Kenya’s development. Those who practice it simply term it as the just cause for the sumptuous life they live. Organizations and institutions tasked to counter it call it a live wire while majority of Kenyans intricately link it to the sorry state of nature in the country, the way things are.Corruption is the main cause of abject poverty that has engulfed majority of the citizens of Kenya. However, the irony is that both who engage in it and those who don’t practice it understand that corruption is indeed a bad thing. It simply involves the diversion of public resources for private gain. Since independence, Kenya has been on the receiving end for being tolerant to corruption as evidenced in the mega sagas in the country such as the National Youth Service scandal, The Health Scam, and The Goldenberg Scandal amongst others. It has led to the reduction of foreign aid aimed at uplifting the social status of the people of Kenya. Evidently, independent reports from both Kenyan Anti-Corruption Agency and the international organizations reports have not only been earth shaking but mind boggling as well. These reports have been able to expose the prevalence of grand corruption that indeed occurs in Kenya. A 2016 Price waters report ranked Kenya as number three most corrupt nation. Recent reports have similarly unearthed massive corruption in the country with Transparency International ranking Kenya as amongst the top 10 most corrupt nations in the world. Indeed, this great nation has been hitting headlines for the wrong reasons. Corruption remains a national security threat despite Kenya being amongst the few African nations that did ratify the United Nations Convention against Corruption, a legally binding document in which Kenya committed to be a zero tolerant nation to corruption. Corruption is intricately tied to the nature of our economy. It remains an existential threat to the realization of government’s commitment to nurturing and protecting the well-being of each and every citizen and the nation as put forth in the preamble of the constitution. Just as President Putin did recently put it, Kenya seems a cemetery for Kenyans. President Trump buttressing this statement refers to African countries as shithole nations. The worst disease in Kenya today is corruption. It is a curse which Kenya suffers from. Its scathing effects has been felt in each and every sector of the economy. As a matter of fact, it has been the cause of the deplorable conditions in our roads, the sorry state of our healthcare systems, the dwindling education system, the unemployment, political crises, and the prevalence of impunity, the increased foreign debts and poverty. It is indeed a multifaceted aspect that actually needs to be cured. Most shockingly, fighting corruption remains one of the political tools used each and every election by politicians to assume public office. Each regime before assuming office has talked tough on this enemy of development. After assuming office, they simply wine and dine with the cartels. The promising politicians that Kenyans have pegged hopes on before elections have ironically metamorphosed from nationalists to cartels. At times, through corruptive means, individuals have rigged elections further threatening the thriving of democratic space in Kenya. They have simply turned a deaf ear on the war on corruption. These politicians have ignored the passionate call of the masses that live a life full of ups and downs at the mercy and glory of God. In exchange of material benefits, individuals and institutions tasked to fight corruption have simply appeared to fight it. They have legalized state sponsored policies that failed in their mandate to hold public servants accountable and responsible. Instead, with the benefits of the corruptive deals, bureaucrats live an opulent lifestyle as the general public cry foul for negligence and betrayal. The only rhetorical questions lingering in their mind is why they do not actually enjoy the rights to development? Does it mean they are not protected by the Kenyan constitution which everyone is theoretically proud of? Why then has the government failed to implement the TJRC report of 2008 that aimed at addressing the social, economic and political challenges that Kenya faces? Does it mean that the state is also an existential threat to her own population? Under the slogan, “I eat, you eat, we eat, “corruption seems a phenomenon with many folds that for a country like Kenya, it seems a farfetched dream to totally eradicate.However,the impossible is always possible. Kenya simply needs to rethink her strategy to fight this nuisance. At the center of eradicating corruption is the need to emancipate the general public about this menace. It simply demands a change in the mentality and the personality of the people of Kenya. Those who fight corruption should be clean. Their level of integrity in public offices should not be questionable. “When you see corruption, when you see injustice, you speak out, don’t just keep quiet and say it is none of my business”Mahal Shariff notes. The general public therefore has a pivotal responsibility to eradicate this cancer that demands everyone’s attention. The citizen’s ignorance is indeed the cartels power. If we elect the same politicians every time, that is a very clear message that we indeed don’t need change. Failure to speak out on this menace simply means we support it.We only cry foul about its effects yet we don’t want to challenge it. Rethinking the nature and effectiveness of our public institutions equally is necessary. It is however important to note that the current institutions, DPP, EACC, DCI have recently waged a recommendable move in this war. Kenyans are eager to eat the fruits. Let it not be that they preach water and drink wine. Transparency and accountability are prerequisites for economic development. Let’s change our mentality, personality and collectively fight corruption. The writer, KAUDO PHILIP, is currently a student of political science in Maseno. 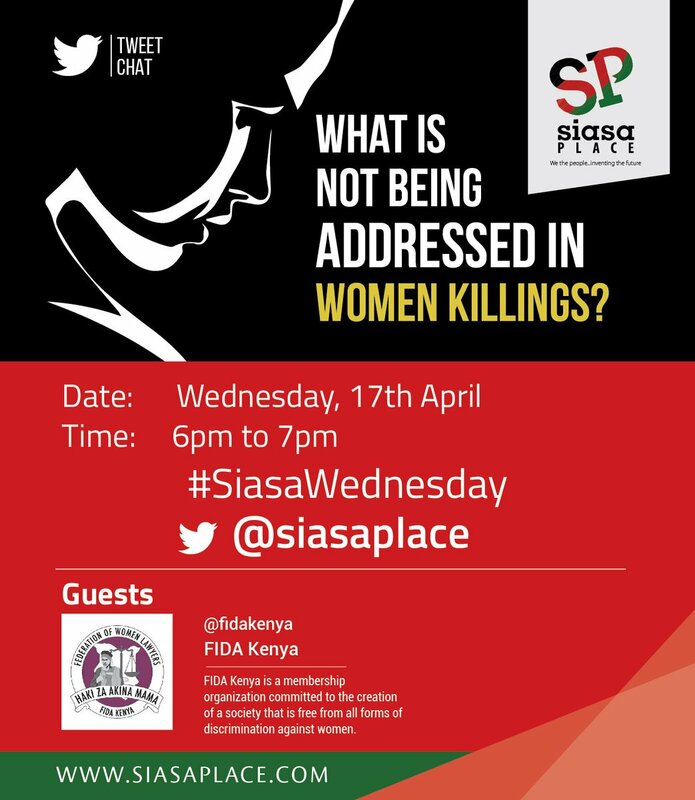 My work at Siasa Place involves travelling a lot across counties and facilitating community engagements. We have community forums with young people on specifically public participation. I enjoy travelling, yes but in each forum, I am presented with different challenges and learning about different cultures, issues and how youth are organized. Recently I was in Samburu County to collect views from the Youth on issues affecting them and how they would want the County to work in supporting them and from the dialogues one thing was clear- The county government does not have adequate avenues for available to engage with youth. The irony of the matter, is that this is within our constitutional provisions as a citizen, but in reality this goes against the objectives of devolution in Article 174 (c) of the Constitution that states that devolution will give powers to self-governance to the people and enhance participation in the exercise of the powers of the state and in making decisions affecting them. Statistically with the youth being the majority, in the country just like in Samburu County it is unrealistic to do anything without involving the youth. Moving across the three constituencies in Samburu that is Baragoi in Samburu North, Wamba in Samburu East and in Maralal town which is the County headquarters the young people said in one voice that they are not meaningfully engaged in County affairs and this results them to make little or no input in the development agenda in the county. While some may fault young people as lazy and who wait to be spoon-fed, it is also vital to identify cultural barriers, such as older people in the society looking down upon youth and that their views are not crucial or even listened to. Another issue in the northern community is women do not have a say despite the progress made by the community of even electing a woman as a member of parliament in the National Assembly representing Samburu West Constituency Hon. Naisula Lesuuda. It is therefore prudent that the society needs to be sensitized on why all the voices matter especially in issues of running the county government. While I fault the County, youth have also lacked passion to be community changers and all they want are hand outs for them to attend their own community forums. Where is the problem? Morals or lack of a way of living? On this, it reminds me in 2007 as a young child, I was in the village and a politician came to our home during campaigns. I was excited to finally see this bearded man who was vying to be the MP in our constituency, my brother and sisters were all excited. He talked to my dad and mum who were eligible voters about his agenda and before leaving our home he gave my dad a brand new two hundred shillings note. I didn’t know what it was for by then but later learnt that it was an incentive for my dad to vote for him on 27th December 2007. 11 years later I remember that incident like it was yesterday. I’m telling this story because a majority of young people that I interact with say, ‘’We don’t ask for money from Politicians.’’ Or ‘’Ukipewa huwezi kataa (If you are given, you cannot say no).’’ when it comes to asking for handouts or being paid to vote. The same mentality applies when it comes even to community forums or meetings, we expect to be paid to help ourselves. We hear a lot about public participation and how it is a powerful tool for the people but it faces a myriad of challenges. Just last week, I was in Chakol North Ward in Busia County following a story by a group of youth from our trainings who had invoked Article 35 1 (a) to ask for information about pending bills from the Ward Administrator. In the meeting that brought together the Ward Administrator, a representative of the Member of County Assembly (MCA) and the youth, I couldn’t help but notice how the Ward Administrator was shaking, she was extremely worried and looked stressed. I think imagining that we would deny her children bread the following day. One could clearly see that she had never been exposed to such kind of interaction. The discussions began and the youth explained what they wanted and why with good backings from the Constitution. In the middle of the talks Mrs. Caren Moitit, the Ward admin said, ‘’Its not that we don’t want to share this information or hold public participation forums the challenge is that my office has no budgetary allocations for the same. It is very hard to call people to a meeting without refreshments they can’t sit on or a bottle of water during the meeting. I hope we can get well-wishers be it Non-governmental organizations to support us have public participation forums.’’ I was shocked at how a whole County can have budgets without a line for public participation or community dialogues. Is this devolution? Or is it a case of money is allocated but does not make it to Mrs. Caren’s office? While these challenges exist it is time the youth realized that nothing can be done for them without them and our involvement will improve how the counties engage us. IN the preamble of the promulgated 2010 constitution of the Republic of Kenya, it commits to nurture and protect the well-being of the individuals, the family, communities and the nation at large. Therefore, the states through elected and nominated representatives are mandated to ensure that Kenya is a better place to be –a safe haven. However, this has not been the case. The politicians have turned a blind eye to their own people, especially the youth. On a comparative basis to other nations particularly developed economies, I as a youth, feel that the state has done little to nurture and protect the well-being of the young people of Kenya, who form the majority of the national population. They have been neglected and their hope that the new constitution would facilitate their empowerment remains shattered. Their voice is scarcely heard, while individuals nominated to represent their views and complaints do not seem to care. The youth continue to question their place in this country. Actually, the political class views them best as an instrument for acquisition of power. In the name of empowering young people, politicians hires them to cause fear and havoc in political rallies. They solicit the youth by promising them lump sum jobs that do not materialize and some handouts. Through this, they deceive them and occupy public offices principally to pursue their narrow selfish interests. It is indeed due to lack of proper empowerment and proper representations that we, as young people live in deplorable conditions. This is despite the fact that the most of us are intelligent, energetic and innovative. Most Youth Empowerment Programs organized by political leaders and stakeholders have been ineffective in solving the pertinent problems ranging from financial incapability to lack of political awareness. Some of the youth forums as recently evidenced in Homabay County, have been politically instigated and never providing solutions. Actually in such organized events, the youth are only given an opportunity to dine and wine with the politicians and that is all. The stakeholders turn a deaf ear on their quest for jobs, enrolment in both technical institutions and universities, nurturing of talent and initiation of projects aimed at helping the youths. At times, they have opted for short term solutions to youth problems. The inefficiency of the state to empower the youth has resulted into more bad than good. Actually, most young people are poverty stricken due to unemployment prompting majority of them, especially those in slums to look for alternative illegal ways to earn a living. Some have opted to join radicalized groups that pose an existential security threat to the people of Kenya. They rob, assassinate in cold blood and at times survivors are left in deplorable condition while conducting the crime. Some have opted to sell hard drugs such as cocaine which is detrimental to a healthy living. Others have to gamble to make ends meet while others hawk in towns. Our youth must not be left vulnerable. The best long term solution to solving problems affecting youth is facilitating real economic empowerment. This involves initiation of income generating projects and funding them with initial capital. The Government of Kenya, should, through seminars and workshop programs, educate the young people on viable means to safety living. These workshops should principally aim at helping them acquire knowledge and skills which are necessary in both the formal and the informal sectors of the economy. At the end of these programs, the young people should be equipped with both soft and hard skills that make them relevant in today’s work environment, as well as be in a position to maximise the few resources available to them for income generation. The youth also need political empowerment, and this could also be used as a strategy to eradicate radicalization. Some young people, especially those in the slums join militia group simply because they feel marginalized and the fact that they lack the requisite knowledge on existing laws. Political empowerment involves creating political awareness about youth related matters amongst them their rights, their role in the society and the mechanisms they can use to air their grievances. Each and every society is established on societal norms and laws. And if our youth are not empowered socially, we risk adopting sinful cultures that are detrimental to our societal beliefs and our cultural orientation is likely to negatively change. An empowered youth is a productive Kenyan. It doesn’t cost much to empower our youth, who are today’s and tomorrow’s leaders. Empowerment of youth has both short term and long term positive effects. The state, interested individuals and the NGOs should consider this noble cause as a collective responsibility. This is one of the ways that can aid our youth feel part and parcel of the society, which will result to Kenya being a safe haven for all. On the other hand, the youth should be committed to continue working hard in all they do. They should explore their talent and be rational in decision making. “It is the working man who is the happy man. It is the idle man who is the miserable man” – Benjamin Franklin. The writer, KAUDO PHILIP, is a former student of Miyuga, Lifeshine Sondu and Oriwo Boys High School and currently a fourth year at Maseno University Pursuing Political science. He hails from Homabay County in wangching ward. I find the quote, “The tree of liberty must be refreshed from time to time by the blood of patriots and tyrants”, by one of America’s founding fathers, as most disturbing when used by present day advocates of liberty. The sentiments portrayed in this quote might have carried currency during the time of its voicing, and in the context of the then prevailing circumstances, but since then, there has been a tremendous shift in thought and moral standards. Owing to man’s intelligent nature, his moral standing is always under the unerring refinement of time. The story of the liberty movement in Kenya is a sad one. It is replete with tales of human suffering and heroic sacrifices. Unlawful detentions, torture, murder, unexplained disappearances and forced exiles among others, make up the script of the blood cuddling experience of those who dared to challenge the status quo. It is unfortunate that the perpetrator in these villainous acts is the government, which in abdication of its core mandate turns about and violates that very which it was established to be a vanguard of. A constitution is a social contract between the people and their leaders. It is supposed to give requisite freedoms, guard against their violation and be a beacon of light to the attendant responsibilities. If it originates from the people, and generated by conscience, it would reflect the aspirations and represent the will of the people. Implementation would be almost automatic and effortless. Its operationalization would ensure a harmonious and prosperous society. The inevitable consequence of the law made by the people is service to the people. There would be no need for acts of violence to preserve human dignity. For people to attain that level of achievement, it would entail a consistent rise in collective conscience, or where a majority of people possess a higher level of conscience, and are committed to the upholding of human dignity regardless of social standing. The principal of human freedom and equality becomes the defining tenet, and those who lead in the movement become the natural leaders, and their ultimate obligation is service to the people. In the alternate, if in a community of people, only a minority have a higher level of conscience than the prevailing majority and where the primary object of those gifted with a higher level of conscience is not protection, and upholding the sanctity of human dignity; the objective inevitably becomes exploitational. We can therefore conclude that there are two types of laws; those made by the people and those made for the people. The law made by the people serves, protects and guards the people against the tyranny of the state. Consequently, in a scenario where the law is made for the people, most often by as small elite, who are not guided by morality and the principle of human dignity, the inevitable result is exploitation of the people. The law becomes a bulwark for the government against its people, and since the motive is self-serving, its lifeline centers on the ignorance of the people and is in the best interest of the state to deliberately, through omission or commission to disenfranchise the people for sustenance. The debate about public participation in the implementation of the constitution confounds me no less when I consider the amount of enthusiasm that was witnessed at its making. Excitement went right through the roof during the referendum drive, and pomp and colour was in abundance during the promulgation. It was touted as perhaps the most progressive document in the world and a source of envy to our neighbours. The atmosphere was pregnant with expectation, and the talk in town was; behold, a new dawn! But the aura of hope generated has since come a cropper. Things are going full circle and the blame talk of the government trying to roll back the gains made through blood and sacrifice is back. I would call this the critical moment where we need an honest soul searching. For starters, we could begin by asking; did we make the constitution, or were we shopped to believe that we did? And if we did, was it out of necessity or requirement? Bertolt put it that the law is made for one thing only, the exploitation of those who don’t understand it, or are prevented by naked misery from obeying it. These are the questions to be rested before the public is questioned of its participation. If any of the answers do not allude to the concept having originated from the people, the place to start is to bring the people on board first, and start at the beginning. THE CONCEPT OF THE CONSTITUTION. Maroko Nyachio is a handcart operator. The most significant underlying issue behind the current fracas in public high schools can be attributed to the fact that students are seen as subjects, but not partners in their education. The disarray also indicates that our education system does not encourage independent thought. Furthermore, high schools lack appropriate disciplinary structures for the modern kid. Students should not be blackmailed every time they react to a situation that they face in schools. The government offering threats to students is also not a solution, but another source for chaos. The way we can start to resolve the current crisis is if the lack of parental participation and overcrowding in schools are acted upon as factors that lead to the rebelling of students. More importantly, students must voice their concerns, and they should be heard. There is a negative narrative that young people are incapable of leading. This is slowly changing and it will continue to do as more young people are standing up to check the systems that do not work for them. We need to keep encouraging the youth and stop telling them that they are the ‘future leaders’. They are the leaders of today, not tomorrow, and they should be fully engaged in all political processes. The increased participation of young people in politics was seen in the 2017 General Elections, and the numbers will even go up during the 2022 General Elections. While we fight for young people’s spaces in politics, it is important that a lot of focus is also directed towards encouraging more (young) women to vie for elected positions. This will be done if women are enabled to take part in public life. Through intense political education, they will be able to understand their rights and the Constitution. This will also empower them to protect their positions when they get elected into office. Finally, there should more advocacy for the 2/3rds gender rule, and more pressure should be put on the Executive to ensure its implementation. The second liberation stands incomplete without women’s participation. The Y Follow campaign is a youth led initiative that seeks to empower the populace to question status quo, and ask relevant questions when it comes to governance in the country. The main objective of YFollow is to empower the common mwananchi to demand for accountability from the leadership and therefore a mindset change that will inform voting patterns from tribal to issue-based. The Y in #YFollow stands for youth and they are the main focus in the initiative, on both National and County levels. The youth have always been associated with being ignorant to current affairs, and this seeks to show them how political decisions affect them personally and how they can get involved. Having also realized that Information is what most of the population is missing, #YFollow will aim to provide relevant information as well as a platform to air grievances and provide solutions in the community and to the leadership. Our main concerns as a movement are Corruption and lack of convictions by the Judiciary. We can see some efforts from the leadership in terms of tackling the issue of corruption with the arrests and court cases, but these remain ineffective until convictions are made and assets are retrieved. One of the other many issues that YFollow will push for, is the review of the 2006 Youth National Policy that is currently outdated, and not in line with the new 2010 Constitution. This tweet chat was addressing the general mistreatment of young people in East Africa who are punished for demanding better leadership, with particular attention to Robert Kyagulangi’s (Bobi Wine) who was the illegally detained by President Museveni’s regime. Why are young leaders considered as a threat? The current leaders believe that they alone are the custodians of power. For long young people have been expected to be spectators of political contestations, but this has to change. There is an abundance of young leaders in the continent today and we are saying, WE WANT MORE SEATS AT THE TABLE. Radical organizing can help citizens deter the state from meting out violence against young leaders. It is easier for the state to isolate few, which is why citizens must find different ways to engage the state in an organized and radical manner. Online spaces also play critical role as governments tighten the noose on media through beatings and threats of closure. Young people must create their own channels, and tell their resistance story. What are the impacts of political violence against young people? Political violence can alter ways of organizing, it slows change but certainly won’t stop it. Like Shirley Chisholm says “If they don’t give you a seat at the table, bring a folding chair.” Young East Africans already have millions of folded chairs. We have also have to be mindful of the intention of those deploying violence. It is make many disinterested in politics, especially young women. We have to ensure that they, and other marginalized groups are also part of the struggle. How can young people protect themselves from state violence? Identify what we are good at: Not everyone will take to the streets, so young people have to create more rooms for different kinds of thoughts around protest. Young people should find what kind of protests to deploy, when, and how can they be more inclusive. Protection: Make sure your digital footprint is intact –VPNs, password protection and encryption. Networking: Cultivate important contacts within government institutions that can come to your defend. Education: Know your rights, understand the constitution, be an active citizen and take responsibility. Vote and advocate for systems that are truly for development of the nation. Uphold your truth and values: Young people can target different pillars of the establishment, using various means. For instance they can start by boycotting businesses that are run by those behind state sponsored violence. Nigeria has at least 91 political parties with different ideologies all within the ambit of the Constitution. Political parties form government and since 1999, we sadly still clamor for good governance. Political parties decide what kind of primaries (direct or Indirect) to hold. They conduct the primaries themselves, under the monitor of Electoral Management body and independent observers like YIAGA AFRICA. Despite parties conducting primaries by themselves, they must adhere to their own guidelines, Electoral Management body guidelines, electoral laws and ultimately the Constitution. There is another aspect of our democracy that needs intensive reform, and this is ensuring that the outcomes of political party primaries are credible enough to instill confidence on the part of citizens. The issue of imposition of candidates, inducement of delegates or manipulation of party members register has continued to cast questions over the credibility of the process. Young people have a lot of roles to play when it comes to party primaries, but the question that remains is whether they are taking part in these processes. The answer is not enough. Young Nigerians can be more involved by first registering as members. This will allow them to be part of party primaries, in case a direct one is conducted. Young people also vote during party primaries, but most times do not fall into the delegates’ categories when it comes indirect primaries. This, in turn makes it difficult for them to have a say in the emergence of candidates. To solve this, the #NotTooYoungToRun movement that is now @ReadyToRunNG has embarked on a ferocious campaign to demand youth candidacy, and open party primaries from all political parties. This will ensure inclusion in our democracy. Since independence, the Police force has been used as a tool of repression, and various systemic human rights violations continue to be committed by police officers. This, has resulted into mistrust between the police and the people. The relationship between the youth and the police is only characterized by conflict and tension, with high levels of anger, fear and mistrust on both sides. In the recent past, many Police officers have killed youth for allegedly engaging in criminal acts and have unlawfully arrested many. A greater sense of command responsibility. Intensified oversight by the public and state organs mandated to oversee the police. Able to empower those at risk of extrajudicial executions. Of propositional with the duty bearers and making clear asks/ demands. Is able to bring partners’ and allies together. The other measures that can be taken is if we make crime prevention a community business, and not just the police. This can be done by sharpening civic support for predictive and intelligence-based policing. This can also help to avoid blanket profiling. Investing in digital capacities including GPS, wearable body cameras, and CCTV cameras in police stations could also make a big difference, as the performance of the police can be easily tracked. There needs to be community sensitization forums that involve both the Police and the public, which can help improve their relationship. The state must also respect, protect and fulfill the right to life, liberty and security of the person, as well as the absolute prohibition of torture. The Civil Society Organizations also work greatly with grassroots organizations (The Justice Centers) to ensure a grassroots approach on police conduct. The grassroots organizations are able to monitor, document and report human rights violations by the police. This information, as well as data can be used to hold them accountable for their actions. The training needs to be one that is intelligence based. The officer should not only be trained on how to use violence to fight violence, but also on other aspects such as Alternative Dispute Resolution and Peace building mechanisms. There are several reasons that can explain the continued increase in taxation. There is a need by the government to raise revenue to bridge the funding gap in the Financial Year of 2018/19, which includes the ability to pay back the 4 trillion foreign debt that we owe our lenders. Other reasons include money lost through corruption, gaps in the tax collection system, and major investment in infrastructure. Increased taxation Vs. reduced expenditure: Tax policy attempts to balance many goals. These include revenue generation, economic efficiency, redistribution, equity between similarly situated taxpayers, and stabilization of economic cycles. However, increasing taxes is what is going to lead us into an economic crisis. A tax policy geared towards stabilization must reduce reliance on tax expenditures relative to government spending; tax expenditures imply that government subsidization moves in tandem with the business cycle, thereby destabilizing the economy. Increasing taxation will discourage investment and saving as income available to households will decrease. Effects of increased taxation on the people: The increase in taxation has only added to the burden of the low-income citizens. Kenyans have been facing high levels of poverty and disparity for the last few years, and this hike will likely exacerbate the problems. Other effects include Increase in commodity prices, reduced investment and savings and inflation. Short and long-term changes as a result of increased taxation: Tax policies can also affect the supply of labor in the short run. A cut in payroll taxes could bring some workers into the labor market or encourage those already working to put in more hours. Other short-term changes include increased government revenue, increased product prices and cost of production, as a well as hiked transportation costs. The long-run effects of tax policies depend not only on their incentive effects but also their deficit effects. Kenya’s debt/GDP ratio: According to Cyntonn Investment, Kenya’s public debt to GDP was estimated at 56.2% in 2017, rising from 44.0% 5-years ago, and 38.4% 10-years ago. This is against the global recommendation of 50%, and the 30%-40% standard range for developing countries. The Kenyan people and power: The people have the power to reverse increased taxation through their representatives in parliament. However, the question that stands is whether these representatives have the people’s interests at heart. Organized demonstrations can also put pressure on the government to revert high taxes. ‘Afro-optimism’ could be the tool to decolonize African mind and lead to Africa`s renaissance, but only if actualized carefully. Ebere Onwudiwe in the book ‘Afro-optimism: Perspective on Africa`s Advances’ refers to Afro-optimism as “the state of absolute conviction that a bright future lies ahead for the African continent.” It’s an ideological notion that the once ‘dark continent’ is on the verge of a grand renaissance, overcoming historical scars; slavery, colonization, dictatorship (poor governance) and corruption. The media particularly social media has been a core driver of this infant but fast rising notion- although quite unnoticed-by giving the largely ‘undocumented continent’ a platform to showcase its values and culture on a global level. Africa in 21st century is increasingly being defined through African literature and not the white precursor. 2018 has witnessed most publicized Afro-optimistic activities, and probably breathing sense to the fairly new notion. First it was the Black Panther an all black cast movie that broke major historical and current stereotypes of black movies not selling and mainly depicting Africa as a super developed continent devoid of foreign exploitation. Africans, Asians, whites and all other races alike lined up in cinema halls across the world dressed in African attire appreciating the culture in support of Africa. The second event is the just concluded world cup football tournament where France whose team is mostly composed of players of African origin, won the cup. The magnitude of this conversation bursting to an exchange between France ambassador to US, Gerard Araud and American based South African comedian Trevor Noah. Noah`s affectionate sentiments, “I’m so exited! Africa won the world cup!” in his satirical Daily show seemed to have angered French ambassador to a point of writing a protest letter to the Daily show criticizing Noah’s sentiments. According to Gerard, Noah comments could be equated to those of a supremacist or racists. This sparked a conversation online about African immigrants in the west particularly France, with Noah accusing the French government of double standards by acknowledging French black players as French but at the same time having harsh stance on African immigrants. Although the two events had a significant impact in bringing to light the ideology of Afro-optimism, the French case raises some important issues regarding the thin line between afro-optimism and afro-pessimism. Coined by Frank Wilderson, a South African intellectual during the apartheid regime, Afro-pessimism was a phrase denoting Africa`s scars of slavery and colonialism and their negative structural impacts to the continent in post-colonial era. His intentions were to use the scars to unite Africans and overcoming post-colonial challenges. However this was short lived as western media hijacked the notion using it to portray Africa as a failure on economic growth and governance. The latter maintaining its meaning up to date. This has been carried on in how Africans perceive or actualize Afro-optimism, making it hard to distinguish between optimism and pessimism. From the two events, despite occurring in the western world, Africans seem to be highly appreciative when a fellow African has made an achievement else where than in Africa which sometimes boarders more on pessimism rather than optimism. French black player`s success united Africa by proving that Africans contribute significantly to foreign successes. The distinction between optimism and pessimism lies in perception. If the player`s success inspires Africans to recognize their potential and extrapolate it from the west to Africa then it’s optimism. On the other hand if it creates a notion of success through developed west facilitation, then its pessimism as it encourages emigrant exodus to the west. The same Afro-pessimism problem affects the African youth today and is considered one of the key drivers of migration. According to a report by Afrobarometer in its mid-report released June this year, it approximates 16% of youth in Africa having thought of emigrating to the west. This worrying figure confirms the level of afro-pessimism on African youth toward their continent and its future. However one cannot deny the fact that there are harsh push factors: political intolerance and unemployment, which propel emigrants to take the life threatening journey. But a keen analysis on the youth justifications reveals that, many believe the west provides the greener pasture irrespective of one being skilled or unskilled, which is not always the case. Is there a formula for inscribing afro-optimism in our minds? Yes, Africans must start by telling The African story, by Africans, for Africans and in Africa. We need to start appreciating African heroes and heroines in Africa so as to inspire change and reduce occidental African heroes. Afro-optimism could be Africa`s soft power especially on a socio-cultural terms by decolonizing our minds from perceiving the western culture as the supreme culture over others. Failure to incept Afro-optimism from our own perspective will render the young concept as just another rhetoric like the once raved pan-Africanism. It might be time for Africa`s renaissance but in order to win over the ‘white man`s consensus’ the process needs to be carefully thought and actualized and Afro-optimism provides the starting point. If it’s all in the mind, then it must start from the mind. Siasa Place seeks a Monitoring and Evaluation (M&E) Officer to be based in Nairobi, Kenya. Reporting to the program manager, the M&E Officer will work with the program team and partners in all data collection, analysis, learning and reporting activities under the DFID grant. In the wake of the report on the mistreatment of Kenyan workers, in the railway sector by foreign contractors, the government, through its spokesman dismissed the allegations as self-centered activism that it has no tolerance for. I have always been confused about the real essence of government in relation to its people. I do not know if I should attribute this to my limited education or whether it is occasioned by the confusion one draws from observing day to day government operations. From my ignorant assumption, I would opine that a government should come to fore as an initiative of the people, informed by the need to have a harmonious existence out of man’s interdependency. With all the naivety of my assumption, I would be forgiven for the consternation with which I received the government communiqué. With a straight face and no minced words, the spokesperson relayed what he called ‘the government position’! After all was said, the sum of it all was that, the government, chided its people, for daring to complain about mistreatment by ‘contractors’ of the state working on a government flagship project which the government has been all too keen to remind all and sundry that it was above board. No questions, no complains, just bow down. You see, I would have no problem with this kind of attitude. I know all too well that authority is not something to be questioned in this part of the world, I don’t even object if authority exhibited dictatorial tendencies (you can throw your stones) benevolent or not. I wouldn’t mind being spoken down to, or being reminded where I belong, I would prostrate to authority if required to. But that is if, and only if, the government is established by the people, for service to the people, and strictly in the interests of the people. This way, I would bubble up with patriotism, but under the current dispensation, I confess to have none. And for the proponents of ‘najivunia kuwa mkenya’, I request that you share the glories that I’m missing out on. From my limited point of view, I would presume that the very essence of a government would be the security of its people. And its core mandate to guard against any threats, real or perceived so that its people live in harmony and happiness, what in mechanical terms would be called ‘shock absorber’. But the security of a people is the people themselves. People are stronger when they combine their strengths and pull their resources together. To do this, they have to establish a central point of coordination; which births the government. The government’s most valuable asset is the people, they are the primary capital. The progress and of any Nation depends on its ability to utilize its human resource, physical and intellectual, for the overall exploitation of its natural resources. The physical human resource is manual labour, the intellectual resource is skills and knowledge. How a people are adept at exploiting these two resources has an overall bearing on their standing in the larger society. A Nation that ensures total utilization of the two consolidates its value; any that sources any of the two from outside its borders exports its value. A government can fall short of the physical human capital if it is hit by a population shortage, (which case we don’t suffer); the intellectual capital if its people are slow in exploring the secrets of the universe. But this does not in any way limit their capability to grasp and execute. It therefore behooves the government facing this challenge to spare no effort in acquiring and arming its people with the requisite knowledge and skills, in order to harness the full potential of its people and consolidate their value and sustain their dignity. But when a government outsources physical human resource, intellectual resource and material capital, like in the case of the SGR, it raises questions like first, do those in government honestly understand the object, role and function of government (of which they can be forgiven if they don’t), or do they have an outside agenda which is contrary to the object of ‘government’? This, I ask because; by the government importing manual and skilled labour, regardless of the project, when it is grappling with runaway unemployment; is that not a travesty? By this very act, it devalues the people, and swaps their essential capital and exposes them to indignity. By government admission, Kenya has no shortage of qualified and skilled people; it only questions their ability to deliver on standard, and finds excuse in the argument that even the private sector is sidestepping locals for expatriates. This begs the question; whose prerogative is it, to ensure proper utilization of our potentials? Citizen participation is a requisite for strengthened devolution, for devolution to work the people must be involved in the decision-making and oversight functions. The objects and principles of devolved government according to Article 174 are to; (c) give powers of self-governance to the people and enhance their participation in the exercise of the powers of the state and in making decisions affecting them, (d) Recognize the rights of the communities to manage their own affairs and to further their development. Public participation is ideally based on belief that those who are affected by a decision have a right to be involved in the decision-making process. A mantra that has fuelled disability rights movements over the years ‘Nothing about us, without us’ James Charlton, the author of a book by the same title expresses the conviction of people with disabilities that they know what is best for them any decision that is made without them is not for them. The whole purpose of citizen involvement through public participation is to give citizens power to have a say in all matters. This ensures governments achieve key milestones in democracy; improved performance as citizens gets involved in identifying their needs, priority areas and increased sense of ownership. Citizens become partners with their governments in a manner that promotes good governance and human rights. To trickle down a sense of ownership on the citizen’s part in development is crucial in minimization of wastage from governments. Without treating citizens as partners there is danger that policies, programmes and interventions implemented at community levels will simply be imposed upon them. Public participation leads to better decisions by improving quality of decisions made in a community. Where a process is inclusive, participants (governments and citizens) get an opportunity to clearly identify issues that are at play in any decision or project or challenge. After identifying issues, clarity is sought so that all views are obtained. All alternatives are weighed and the best option is picked to aid in decision-making. Decisions made in this manner benefit from community contribution, which is vital as they’re most affected. They know what they need and are more likely to be better than a decision made without their involvement. Public participation helps in setting priorities as it informs government the level of importance the citizens attach to a particular situation which helps in channelling of resources (monetary and otherwise). Public participation reduces conflict as working together with diverse people can be difficult, different opinions or diverse interests in decisions can lead to conflict especially at the backdrop of campaign promises. However, public participation ensures potential areas of disagreement are identified and addressed with concerned people before a decision is made. The fears and interests of such groups are addressed and they become part of the decision-making process. When an agreement is reached the potential for conflict is minimized if not eliminated altogether. What has been provided in the constitution and other secondary legislation; In Article 232 on the Values and principles of public service part (1) include (d) involvement of the people in the process of policy-making (e) accountability for administrative acts (f) Transparency and provision to the public of timely and accurate information. Leaders should ensure they are accessible and represent citizens, ensure existence of forums and opportunities for citizens. Provide civic education on public participation in simplified formats and the key elements of it like budget making and policy development. Develop effective communication channels with citizens, this includes both online and offline channels as well as mobile and non-mobile channels in all languages understandable to the citizens. Using those channels to get information out in advance and to a proper depth so participation, decision making is informed and effective. Provide timely and useful information to the citizens on critical and emerging issues. Provide resources to facilitate public participation, on budget making, policy issues, project options etc. Opening channels for public participation goes a long way to ensure that county governments are more responsive to citizens as collaborators and clients hence spur development. I think as a national value, participation of the people comes with myriad of challenges. Challenges that can be addressed jointly, proper frameworks should be set out to make it more effective. It should be free from predetermined outcomes as often is the case where county officials use citizen forums to rubber stamp their already developed plans. They have to be as inclusive as possible, youth and women should particularly be prioritized. Public participation when properly done enhances shared responsibility in county’s development. Is lack of evidence helping suspects go scot free in the justice system? Kenya has an adversarial system of law, where the Judges take a spectator position and weigh the evidence brought before the court. The problem here does not lack of judicial powers, but it is whether the Judiciary is ready to apply the law effectively in corruption cases. The judiciary can, however, in practice set standards. Corruption laws (Anti-corruption Act) provides a mandatory sentence for twice the benefit a corruption offender gets from corruption. We have the laws, and the question that is raised is whether we are ready to prosecute. The independence of the Judiciary has greatly improved since the Moi Regime, but we are not there yet. The Judiciary needs to prove to Kenyans that they cannot be intimidated; the recent denial of bail of the NYS suspects is a good start. Poverty rates in Kenya are higher than they ought to be, and this is as a result of public theft. The causative relationship between poverty and theft of public funds is that, above all else, the resultant higher borrowing and taxes levied on the general citizenry discourages production and that leads to higher than natural incidence of poverty. It is also possible for the taxpayer to exercise their sovereignty to protect themselves from the repercussions of public theft. The people can pass laws that can check this bad behavior through a referendum. What other countries have done to reduce government over expenditure and theft, is to tie spending to revenues. The logic here is that the less they can spend, the less they can steal. Balanced budget amendments helps in adopting this approach. Kenya is also a lucky country in the sense that it has a large private sector as government accounts for, perhaps, give or take, 30% of total spending. Consequently, private sector activity is typically more than 65%. This, to a degree, allows the economy to cope with government failure. One of the main things that can be done to reduce public theft is education. We need to make economic knowledge general knowledge so that we look at things from a practical perspective. That way, we will be able to understand what is at stake better when political promises are being made. Can the Kenyan people survive a 3.07 trillion Kshs budgetary estimate? This year’s budgetary estimate is 3.07 Trillion Kshs. Kenyans have witnessed a dramatic increase of more than one trillion Kshs, in comparison to last year’s figure of 2.6 billion kshs. This current budget highlights a major challenge, which lies in its funding. Research indicates that there is a gap in the budget of 562 billion KES, and the treasury claims that half of the budget will be financed from borrowing. The budget is too high, and there are no justifications for some decisions such as the VAT exemptions for basic items, and keeping the VAT rate at 16. On the possibility of capping the budget; the IEA, an economic think tank in Kenya, found that Kenya’s budget can be sufficient at just 2 Trillion KSHS, where the founder, Kwame Owino, suggested it should be capped. On checks and balances; Article 12 of the Constitution has sufficient controls of the country’s expenditure. Through the Public Participation Act, Kenyan people can also voice their concerns over any public issues, including the budget. Through this act over expenditure can be minimized. Within the budget there was no information on the challenges experienced with the implementation of last year’s budget. Fighting corruption was one of the key issue that was briefly talked about by the CS for the National Treasury, when asked about the issue. The formation of coalitions in Kenya began on a positive note changing the monolithic structure that existed before 1992. However, the political structure in Kenya has become very corrupt which continues the ability of political parties/coalitions to withstand the test of time. As a result, Kenya’s political and economic system cannot guarantee free and fair competition. This is also because all systems are controlled by a small elite that determines who participates and how. For this to change, Kenyan Youth and other oppressed population groups must realize how much political elites fear an informed, angry, mobilized and organized citizenry. They will be able to defeat bad leadership if they are equipped with knowledge, which will be followed by actions. Role of Media: Is it harnessing gains or losing ground? The role of journalism continues to evolve, and we still haven’t taken time to evaluate this. As a result, media continues to seem like it has lost the integral part it played as the fourth estate in Kenya’s first liberation. For the East African media to be effective, it has to be able to maintain the trust of the public. As this has not been proved to be the case yet, other alternatives such as citizen journalism will continue to change the course of how stories are developed and consumed. Citizen Journalism has opened up a space for citizens to hold their leaders accountable, and be able to influence political outcomes. Citizens are able to tell their stories without state interference. However, for citizen journalism to be efficiently explored, there has to be paid attention to fact-checking and source-balancing to avoid the spread of false information. In regards to independence in media; the most important question is asking how this freedom can be harnessed. For instance, the Constitution of Kenya guarantees media freedom, but this is limited by Editors and the Media Council as a result of factors such as ownership and control. This challenge can be addressed through the establishment of publicly funded broadcasters. This way, citizens will easily demand for accountability and media will be more people and issue oriented, as opposed to media setting its own agenda. Technology has also largely influenced East African media. It has liberalized the dissemination of information, and there is a wider and diverse audience that can be tapped into. There are now various ways in which content can reach consumers using means such as websites, videos, and podcasts. There has also been more employment opportunities as journalists are now working as freelancers. Every journalist can be their own cameraman, photographer, editor and producer. In conclusion, the future position of media in the East African Region lies in the hands of its citizens. Equality in Media: Fact or Fiction? Equal representation in media allows everyone to belong, gives everybody a voice, which can lead to freedom. Equal representation amplifies the voices of the minority, and raises awareness on their issues and work that they do. One of the ways in which this can be achieved is if journalists learn to go beyond the headlines, do more homework, especially when it comes to minorities. Learning to listen, look for the story within the story, or change an angle to how they look into an issue, could make a big difference. The government could also do better in ensuring that laws/policies on equality are well implemented in media. What ails these agencies is nepotism, corruption, and the fact that those within the field allow themselves to be manipulated by external forces. Technology and citizen journalism have also given a voice to the marginalized groups. Women in the villages have been able to carry practice journalism and report from their own locality. Through citizen journalism, groups have also been able to raise pertinent issues that have brought about policy change. For example, #StreetNakuru and its founder James Wakibia pushed for the ban on plastic through the #ISupportBanPlasticsKE campaign. In conclusion, every person has a unique story and they should be given a platform on which it can be shared. In 2002, I remember my father driving me and my younger brother through downtown Nairobi.My father loved taking us for long drives around the capital, just taking in the scenic beauty of the City in the Sun. After our ride, we would always end up in the CBD, where he would buy us ice cream in this very old but classic ice cream store on Koinange Street that still stands today. I always sat at the back as my younger brother sat in the front seat with my father. I remember being fascinated to see a woman standing in the sun roof of a moving Prado.It was Charity Ngilu with her fist held high! Chanting those very words. Then I saw my father roll down his window and join in, “Rainbow! Rainbow!” As he drove past the motorcade, some men ran to his window to shake his hand. A sense of brotherhood existed among strangers.I was not yet of voting age, but I remember wishing I was. That year, Kenya was officially the most optimistic country in the world. People had taken charge of their lives.Like I said, I was too young to vote, but I remember wishing that I was! It was a time when we as a people all collectively knew what was best for the country. Ordinary citizens wanted to get rid of the vice called corruption and for the country to make progress.President Mwai Kibaki was voted in on the explicit promise that he would get rid of corruption. During Kibaki’s inauguration, he announced the Public Officer Ethics Act, which required government employees to declare their wealth, to deter them from stealing public funds. The Act applied to all civil servants, all 660,000 of them. Tanzania and Uganda only required key positions to fill the declarations. Kenya made it compulsory for all civil servants including their spouses and children. This made sense; looking at the current scandals, the first business partners in any quick money venture are close relatives. However, the fact that this information was not computerised and further had to be kept for 30 years, meant that storage space quickly became a problem. In May 2007, the United Nations awarded Kenya its annual Public Service Award “for improving transparency, accountability and responsiveness in the public sector.” Although the Kibaki administration received awards, including from the World Bank, the Act failed to offer any guidance on what action should be taken if wrongdoing emerged. Not a single public officer was prosecuted during President Kibaki’s time. Fast forward to 16 years later. I have witnessed three other elections and the rhetoric has remained the same; corruption not only continues to prevail but appears to be on the rise due to devolution.The annual reports by the Auditor General appear more daunting with every passing year. President Uhuru Kenyatta, surprise, surprise, recently announced that civil servants will have to declare their wealth. The question is, what are the repercussions for those who do not declare their wealth? What about those in whose cases discrepancies are found? What legal actions will be taken against them? What other systems have been put in place for better tracking and record keeping? As of now, we appear to be reading from the same script but with a different cast. You can also read the original article posted on East African Standard – Kenya’s workers walk to work, MPs pocket best salaries. After every election year, as surely as the night follows the day, Kenyan Members of Parliament use the House’s opening session to increase their salaries.Taking a closer look at the East African region, Kenya comes first when it comes to MPs’ pay, Uganda second and then Tanzania and Rwanda. There is no doubt that Kenyan legislators are among the best paid in the world. In 2013, a study conducted by the Inter-Parliamentary Union compared the salaries of different parliaments around the world. It noted that, from 2008, there was a not unexpected decline in these salaries due to the global economic crisis.Given ever-rising populations, governments will have to find ways of saving resources in order to sustain their people.However, common sense is not so common these days. Considering that legislators in Kenya earn more than any other East African country, is this in correlation to our population? Both Kenya and Uganda have over 400 legislators but are smaller in population size compared with Tanzania. Tanzania has a population of 59 million, Uganda 44 million and Kenya 50 million. In Uganda, the total number of legislators is 432, Kenya has 416 and Tanzania 357.Examining other countries in Africa, the same imbalance emerges. South Africa, which has a population of 57 million and Nigeria with 195 million, have 490 and 469 legislators each. The GDP in South Africa and Nigeria is also higher. Once more, we seem to be overrepresented in our legislature. Still, the bone of contention is the salaries that we pay MPs. On May 1, 2017, President Uhuru Kenyatta made a Labour Day announcement increasing minimum wages by 18 per cent. On Labour Day 2018, President Kenyatta increased the wage again, by five per cent, and complaints were heard to the effect that the previous 18 per cent had not been implemented.What does that mean to the average worker? For instance in Nairobi, Kisumu and Mombasa, Kenya’s three main cities, a worker earning a minimum wage of Ksh12,900 ($129) will earn Ksh620 ($6.20) more. That means that if they travel by matatu for 30 shillings one way, working five days a week, the addition to their salary can pay for transport for two weeks. That is, if you are lucky enough not to work Saturdays. If your transport is 60 shillings per trip, then you have transport for one week. Thus the increment cannot even support a worker’s transport to their place of work. Mind you, MPs’ basic pay is in the range of Ksh600-700,000 ($6,000-$7,000). Recently, as I was heading to the office, I took a moment to observe the number of people who walk to work. There is such a large number and it seems to be increasing by the day, because getting to work is so expensive. Although the minimum wage has been set by the president, thousands of workers still receive pay below that amount, many receive below 50 per cent of the stipulated wage. When it comes to increasing salaries for the average worker, this offer is literally peanuts. Granted, salaries for people who work in public office are not always easy to determine.Although many elected officials claim to need high salaries because of the demands of their voters, the solution is not to increase their salaries to sustain handouts, but to find ways to alleviate poverty so that people are not dependent on handouts. Many countries have come up with proposals to place caps on the differential between the highest earner and lowest earner so as to keep resources allocated for public wages reasonable.Listening to Members of Parliament talk about the difference between a house loan and a mortgage while they receive sitting allowances, vehicles, medical insurance and other privileges that the taxpayer will have to pay for, it is clear their heads are in the clouds and they are out of touch with what the people they lead actually need. Title of the topic: Social Media & Politics: Where are we as a country? In today’s world, news and information are critical components of everyday life. With change in dynamics, various avenues of connecting with friends, sharing news and information, and real time connection has led to many people especially the youth, embrace social media to serve their various needs. Digital space has given many Kenyans a voice that was otherwise a monopoly of mainstream media. It gives platform demanding for transparency and accountability when it comes to political offices. Social media has straightened voices. Social media will continue to be used as a tool for driving future changes in society as an avenue of enabling people express themselves. Measures must be put in place to curb the spread of fake news. Citizens must come together and shrinking civic spaces must be kept alive. Technology has the capacity to amplify the voices of citizens and greatly improve oversight. Government should instead embrace social media as a feedback platform for better service delivery and accountability. Title of the topic: Disaster management: Where are we as a country? Disasters are majorly unpredictable occurrences that have serious negative consequences on the lives of the people. It is for this reason that as a society, we need to be fully and adequately prepared to initiate intervention mechanisms whenever faced with any kind of disaster to avert casualties, disruption of social order and to save lives and property. Disasters disrupt the functioning of society causing widespread human, material, economic and environmental loses which exceed the ability of the affected society to cope with using its own resources. Examples include drought, floods, fires and earthquakes. All stakeholders in society must come together to form multi-agency rapid response units for interventions and rapid response. Government should involve and support stakeholders that deal with matters of humanity and disaster management to help mitigate emergencies. Both National and County governments should follow best international practice in handling disasters whenever they strike i.e. Preparedness, Reaction, Recovery and Prevention. Political goodwill and commitment is key to the implementation of the National Disaster Policy. Title of the topic: What is the impact of public theft without consequences? Corruption as the abuse of entrusted power for private gain. Anyone exercising power given to them by others, if they abuse it for personal benefit they are corrupt. It results to very serious consequences that impede the overall well-being and order of any society/state. It impedes development and service delivery meant for public good. The AKU’s East African Institute youth study 2016 found that 21-58% of youth believe it doesn’t matter how one makes money so long as you don’t get caught; 30-58% admired those who made money in any way; 8-45% believed corruption was profitable. The problem today is too many points of theft with no accountability. Also cultural tolerance seems to have gone up, sadly watering down tenets of Chapter Six of our constitution. Theft without consequences – impunity – causes an erosion of confidence in public institutions, leaders and the law. Ultimately this destabilizes the politics and causes dislocations in society that manifest in a myriad of ways. There is need to make it hard to steal and get away with it. If institutions fail to hold those who steal to account, publicly ostracizing them should be the norm. Parents should live upright and honest lives while moulding the lives of the young ones. If they are busy stealing from the government the apple will not fall far from the tree. We need to look critically at corruption as theft. We never celebrate those who steal from our houses. Why do we celebrate those who still from our pockets indirectly? Title of the topic: Are social movements able to offer solutions to matters affecting the nation? Social movements play vital roles in educating, informing and empowering communities. Through social movements, many communities especially in developing economies have realized serious changes in approaches to the challenges they face, while coming up with sustainable solutions modeled for long and short terms. Social movements have played a leading role in bringing about change in Kenya. All major social and political changes that have happened in Kenya have been birthed through social movements. From the Mau Mau movement in 1960s to the 2010 constitution. Social movements come in two fold, both negative and positive. Positive in the sense that the oppressive nature of the status quo has created interest in social movements as an alternative and a viable option to bring about fundamental change. Negatively in the sense that by keeping the majority of Kenyans from taking it upon themselves to bring about change. They have perpetuated the notion that the problems we have as a country were meant to be and no one can do anything about it. Social movements can be a great vehicle to rally the people into taking on corruption in government rather than waiting on your favorite politician to do it. Through training and practice, we are not reinventing the wheel but building on best practices that others have used with great success. Most important is that it will spread its basic theory that change only happen when the people themselves participate in bringing about the change they desire. There is no other being coming to bring about change in Kenya, it’s the people to do it. If one compares the political participation of youth in East Africa, then Kenya leads in having the most youth aged representatives in public office – between 18 and 34 years old. Considering that last election dragged on and on for an extra 3 months due to exceptional circumstances, public rallies were still filled to capacity with engaged young people. However, according to the Next Generation Kenya 2018 Survey conducted by the British Council; 78% of young Tanzanians said that youth participation in politics and decision making was high, compared with only 38% of young Kenyans. The big difference refers to the decision making rather than the participation part. Without doubt young Kenyans are very interested in political issues and most discuss politics daily. We know that decisions being made affect us greatly however, the problem is that our interest is greater than our involvement. And that is not by choice but by design. Youth are seen as ceremonial, they are seen as foot soldiers, those to be ordered around to fill spaces only to be seen and not heard. We are treated like children not adults. When it comes to those who most feel powerless, it is women, people with disabilities and the youth from lower social economic groups who are most marginalized. In short what I mean is poor people are vulnerable and because of this vulnerability they’re invisible. After the handshake, the hugs and the forgiving of each other how will these diverse groups of young and marginalized people be represented? When the ‘Building Bridges’ 14-member team was announced, there was uproar from our young people as to how they were not represented as part of the team. Some analysts – usually male and old – predictably took to Twitter stating clearly that young people have nothing to do with reconciliation because “youth do not understand the historical context of the rift and cannot be part of the steering committee to build the nation towards cohesion. Youth simply do not understand the issues.” Is this really a good reason? Is this really true? Are we Building Bridges to the past or the future? Who will live to see the consequences of the decisions made for the longest – the old men or the youth? Working as I do for a youth focused NGO I have had hundreds of discussions with the young people of this country – from many parts of this country and it is clear that most young people feel ignored and marginalized from the decisions that most affect them. The reasons they give are based on local culture, on the way the system works and on instances of actual marginalization. There is an Ibo saying, “What an elder can see while sitting down, a youth cannot see standing up” Basically meaning that the lack of experience automatically excludes youth and in our case in Kenya the assumed lack of experience. Elders due to their experience are to be respected and involved in all decisions and so in many instances forcing young people to conform to tradition and say nothing and contribute nothing. Basically an elder is to be listened to at all times while the youth can wait their turn. I have been in conversations with youth who are waiting to turn 35 in order to speak up on community issues. So just like the African proverb, critical initiatives such as ‘Building Bridges’ are adult things. They are not for the Youth who have no place discussing such heavy national matters that will determine the future and our national peace, unity or growth. But how can the youth be blamed for not having experience? How do they get that experience unless they are intentionally included to sit at the table and listen and learn? It might be that they do not understand everything – but who does? Part of the problem is that youth are not properly educated on correct history to begin with. Much of it is hidden in our murky and not so glorious past. We are given a sanitized version at school and university and have to go digging to get the truth of the injustices that have gone on for generations. But we know enough. We know things could and should be better. We know our elders have not always done well and have not put the country first. We know this present anger at corruption is not the first time it has happened. We might not know all the gory details but we know of Goldenberg, Anglo Leasing, land grabbing, the oathing, the litany of unresolved murders, the massacres and the tortures. We are not asking for the ‘Building Bridges’ team to be filled with youth but we are saying we must be there. Let us have a voice and a contribution. Listen to our hopes and dreams and expectations. Listen to our angst and fears and challenges. Listen to our suggestions and ideas and proposals. Let us reason together. Let us feel part of the future being decided for us. Let us change how we think, talk and engage about Kenya. To include us is not only right it is sense. They already know how to be friends without the media being present to capture the hugs and smiles and tendering of apologies. There seems to be a disconnect of logic. How can the majority of the population be sidelined from an initiative that is supposed to benefit the very population being marginalized? Who exactly will drive the initiative forward once the wazee have decided? We hear mantras endlessly recited about investing in our youth, yet, when opportunities come where youth should be involved we are tossed to the sideline. It is patronizing, unacceptable and unconstitutional. If the ‘Building Bridges’ team were actually to physically build a bridge you can bet your last shilling that the youth would be called upon to do the heavy lifting that is of course if the money for the actual bridge isn’t stolen. To exclude them from the design of the bridge – and determine the strength and length and width and the materials used – is nonsensical. Most young people in the Next Generation study between the ages of 15-24 agreed that tribalism was encouraged by their parents. The Report also highlighted that knowledge of youth initiatives in regions furthest away from Nairobi were less well known. The building bridges initiative cannot be Nairobi based or elitist or ageist and the involvement of the youth is not only necessary but essential if it is to work. It must be designed and owned by including young people otherwise this bridge will collapse. The restrictive cyber laws that we see being passed across the region are limiting opportunities. In most countries in East Africa, the majority of the population is below the age of 20. This means that we are raising a new generation, often called Generation Z or Gen Z, made up of young people born in the late 1990s and early 2000s.We have to recognise that though there are similarities between Millennials (the generation before Gen Z), there are also differences.Research shows that Millennials were born in an era where the smartphone was being explored.Most of them can actively engage two devices while Generation Z can access up to five devices at a time on completely different platforms. Millennials are good at sharing content; they often retweet, or share information that they agree with: Hence the rapid growth of Facebook when it was launched in 2004.However, Generation Z are more inclined to create content. They believe that they are the centre of their lives and marketing agencies have recognised this, which is why most advertisements have people that the audience can relate to – consumers would rather see a relatable face than a celebrity. That is also why we witness platforms such as Instagram and Snapchat growing at exponential speed while Facebook use is on the decline, since more users now prefer to upload their own stories.For a generation that creates online, restrictive legislation will become a barrier to creativity, innovation and opportunity in the country.For instance, Uganda has put in place a tax on social media platforms. Not only are these groups convenient for sharing information, they also provide a means for youth to organise themselves.Many young people are able to host meetings in WhatsApp with not just other youth in their community but also across countries. It is affordable to the point where several prefer to use WhatsApp to call peers rather than calling through a phone line. It is cheaper! In Kenya, the Cyber Crimes Bill 2018 introduces a punitive penalty on those those who spread fake news on social media. During the election period in 2017, there was in fact a great deal of fake news circulating on social media. Additionally, most youth receive their information from social media and not trusted news sources. Research shows that up to 60 per cent of Kenyan citizens had consumed fake news last year. The rapid rise of hate speech during electoral periods led directly to this attempt to muzzle social media users. Anyone found guilty of spreading hate speech, fake news and pornographic materials will be liable to a two-year jail term or a fine of Ksh5 million ($50,000). However, many human-rights activists worry that there no clear-cut definitions of what constitutes freedom of speech. How can information be verified, for instance, if it comes from a journalist who is professionally bound not to expose his or her sources? How do you balance your right to freedom of speech and accusations of spreading hate speech? Recently, Tanzania also put regulations on social media users such as bloggers to register their entities and pay a fee as high as $900 to do so. A popular online platform, Jamii Forums, was recently shut down because it was judged not to be compliant with the new regulations. Cyber laws can, of course, help to protect citizens from cyber bullying, terrorism and cyber-crime. However, young people depend on the internet now more than any previous generation. Technology is one sector that has created employment and so, even as we continue to rely on it for communication, it is an avenue for opportunities as well. Although regulations are needed for online usage, placing high fees on these very platforms will reduce access to young people due to lack of affordability. These spaces should be fairly priced in order to create a conducive environment for young people to grasp and create opportunities. With many youth having access to technology, more opportunities will be built online. However, without allowing this space to be reachable to young people it will cause them to deter from these spaces.